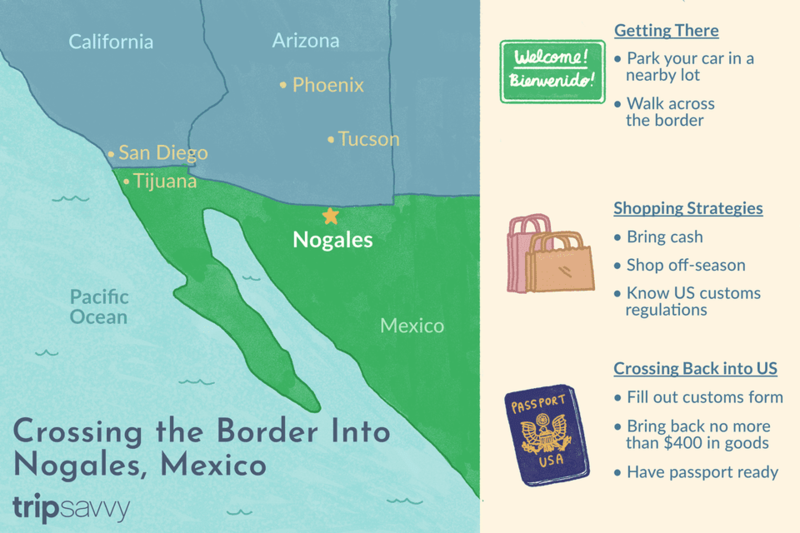 Should you or shouldn't you cross the border into Nogales, Mexico? We were surprised by the ease of crossing the border and what was to be found on the other side. A year or so ago a State Department warning said Nogales was among several Mexican border cities that "have recently experienced public shootouts during daily hours." Currently the Department of State has asked that embassy families leave the cities on the Mexican border towns, especially. This doesn't mean you shouldn't go, it does mean that if you are concerned it's good to check with the State Department, U.S. Border Patrol or local tourism officials before planning your border crossing. If you follow Interstate 19 south of Tucson, Arizona, you will end right at the border from Nogales, Arizona to Nogales, Sonora. According to the Sonora, Mexico Tourism website, Nogales is named after a ranch that achieved world-wide fame during the colonial period and was located southeast of the present city of Nogales, Sonora. The city of Nogales arose spontaneously near the point at which the American transcontinental railroad connected the railroad of Sonora, a project completed in 1882. You may have heard news stories that portrayed the border between Arizona and Mexico as some kind of war zone or no-man’s land. When I headed south to Nogales, Arizona, visions of National Guard troops and vigilantes danced in my mind. Had the border become a place to avoid? I was headed to find out. I was easily enticed by a day of shopping and dinner at a well-known Mexican restaurant in Nogales, Sonora and reassurances from a local woman that all would be well. I was joined by a representative from the local Santa Cruz County, Arizona tourism council who shops in Nogales so often and attends so many meetings in Nogales that she knows many shopkeepers by name. We drove down Highway 19 and took the “International Border” exit. In no time at all, we saw many signs for parking lots on the American side. None of them charged over $5 and all expected cash. My friend said that the car and it’s contents would be safe. We paid the fee and headed toward the border… a very brief walk. What I noticed as I approached the border was the absence of armed troops or guards. Across the street there were a few men in white shirts, apparently U.S. Border Partrol. They looked anything but militant. In fact it was a busy shopping day with families crossing from Nogales, Sonora into the U.S. to stock up on supplies. Women with baby strollers were returning back into Mexico with their purchases and joined us at the border turnstiles. Walking into Mexico was simple. No one asked for our identification. No one even eyed us, it seemed. Once we walked through the passageway and headed out into the streets, we knew we were in Mexico. Rows of pharmacies and crowded little shops lined the broken sidewalks. Friendly vendors invited us in for shopping. But we passed these shops quite quickly and headed deeper into the Nogales downtown shopping area. My friend showed me a great passageway off a main street. It was brilliant with color and was a fantastic place to shop. There was pottery, paper flowers, punched tin stars, copperware, knock-off purses, straw hats and more. We headed in one shop and out the other. They were joined in the back by another set of passageways. Remembering that we were in Mexico, I looked at a piece of pottery, decided how much I felt it was worth and then inquired about the price. Of course the first price I was offered was way high. The brightly painted dish was not worth $30! When I said that was a bit much, the shop owner reduced the price to $20. I countered with $10 (which was what I thought it was worth) and he said, in perfect English, “Let’s split the difference,” meaning he would reduce the price to $15. It wasn’t very crowded that day and I held firm to my original $10. He ended up selling me the plate for $10. In reality the $15.00 price was about right. Expect to pay half of what you are originally quoted. The shop owners expect to bargain with you. In one shop, the items were priced, but the shopkeeper quickly said, “That price is for my enemies.”My friend showed me several shops where prices were marked. There are a few. We headed into a small liquor store, Pepe's House on Ave. Obregon, where she wanted to show me some good prices on liquors. The owner was very friendly and showed is a great selection of Tequilas and advised us on how to choose a good Tequila. He also said that tasting is no longer allowed in the stores. The prices there seemed very reasonable.Day of the Dead in April? Shop before you buy. Not only will you get the best selection, you will have more bargaining leverage if you know prices from other shops. Bring cash. Some shops, especially liquor stores, will accept checks but most are reluctant to accept credit cards. They may charge you a fee, if they do. Ask others where the best shops are. Word of mouth recommendations are very helpful. If you can, shop off-season (Summer). You may get better prices. Know the U.S. Customs regulations. Should You Eat in Nogales? You know, I had the same question. But the answer is a definite “yes!” Again, there are restaurants that are known for serving quality food and who have a large American following. Get recommendations from those in the know. Everyone we spoke with recommended “La Roca,” the restaurant built into the rock cliff just across the border. La Roca has an interesting history and has been passed down through the Alicia Bon Martin’s family since 1972.We were invited to dine with Alicia and her husband. After touring the beautifully decorated restaurant, we sat in a corner booth and chatted. We learned that Alicia had ordered appetizers for us and we enjoyed Margaritas (here's a Free Margarita Coupon for you) and non-alcoholic fruit drinks. I especially liked the shrimp quesadilla. The shrimp was very fresh and the salsa fresca was a perfect accompaniment.As the evening progressed, we were introduced to several of the restaurant’s specialties which were all excellent. We enjoyed hearing about the surprise anniversary party that Alicia held for her parents at La Roca and could easily envision her parent’s surprise when they entered the restaurant by a back door, found it dark and once the light switch was thrown, found themselves in a beautifully decorated party with music, family and friends.The restaurant is a love of Alicia’s and her family but they are known as owners of a large produce business which has been run by her family for three generations. The distribution of their produce stretches throughout the United States. We found out some interesting things about Nogales. Evidently over 80% of the produce coming into the U.S. passes through Nogales, a busy Port of Entry.Having enjoyed the evening immensely, we said our farewells, walked down the street, across the railroad tracks and back to the well-lighted border crossing. Crossing the Border into the U.S. If you are a U.S. citizen, border crossing is fairly uncomplicated. To walk across the border and return to the U.S. is fairly easy. Read this helpful summary on recommended documents. As of June 1, 2009 American citizens will need a passport or passport card to cross the border back in to the U.S., even on foot for the day. State Department Passport Updates. If you are not a U.S. citizen, be sure to have your passport in hand. If you wish to drive over the border, you can do so but there are important regulations that must be followed. Our Student Travel writer has an excellent article. The Nogales, Arizona Chamber of Commerce also provides good information on how to drive in Mexico. In general, you can bring back up to $400 worth of goods without being taxed. Our Student Travel writer has a listing of restrictions that is helpful to review before shopping in Mexico. The restrictions are minimal, it is fairly safe during the daytime in the shopping areas of Nogales, and you can eat at the better restaurants and drink the bottled water that will be offered to you. It would be a shame to miss the color and culture of Nogales, Mexico due to border conflict worries. Just keep your eyes open, carry your purse or wallet safely, don't wear expensive jewelry, and enjoy a day of shopping and dining in this fun, Mexican border town.